The Ladybug had a lemonade stand a few weeks ago. If she could, she'd have one everyday this summer. So I thought a lemonade stand birthday party would be a perfect choice for celebrating her 5th birthday. 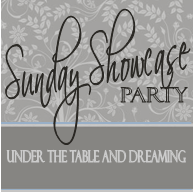 I knew I wanted to make it myself, but this invite at LaBelle Parties was my inspiration. 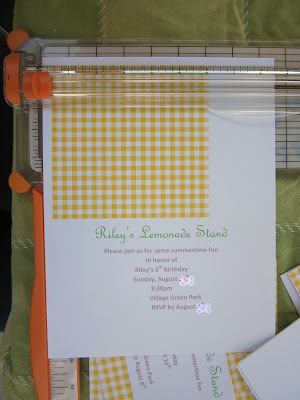 I used a digital paper pack from Goodness & Fun for the yellow gingham. To save a little paper I printed the gingham and invitation text on one card stock sheet. 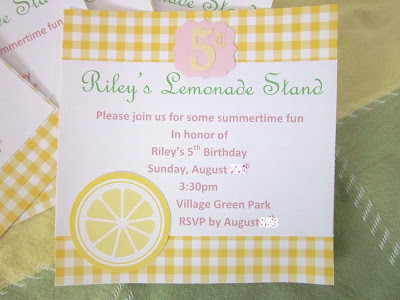 The lemon slice at the bottom of the invite was a free printable from Wendolonia. I printed a couple sheets of sticker paper for sealing the envelopes. I have an lemonade stand board on pinterest for inspiration. I'll be linking up at THESE parties. Please visit them, too. This is an adorable idea. My little wants to host an art show. It never occured to me to make that her birthday theme until now. Thank you so much for the inspiration!! What a cute idea! I love the 5 cents too. What a fun way to include the age. I am pinning this so I remember it for future birthday parties! I love, love, love this idea and party theme! I am planning my daughters 5th party too (she shares her party with her younger sister turning 3). This invite is absolutely adorable! I want a lemonade stand too and I just saw a great idea over at Lisa Storms blog. Did you see it? Wow. I am going on and on...saw you at T&J and peeked in to say hi!